Myanmar Imposes New Curfews Amid Anti-Muslim Violence : The Two-Way The latest violence began following an argument between a Muslim goldsmith and his Buddhist customers in a central city. 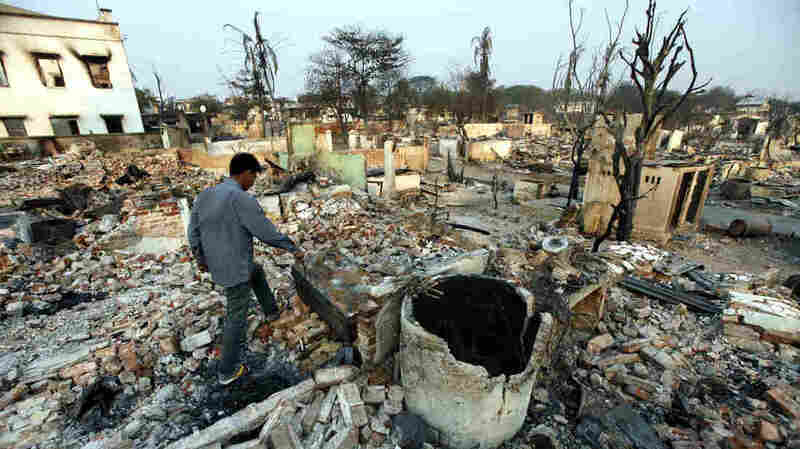 Ethnic violence in the former Burma comes as the government introduces democratic reforms after decades of military rule. A man walks amid debris of buildings destroyed during ethnic unrest between Buddhists and Muslims in Meikhtila, about 340 miles north of Yangon, Myanmar, on Monday. The government of Myanmar has imposed a dawn-to-dusk curfew in three townships amid growing anti-Muslim violence that is drawing closer to the main city of Yangon. Violence against Muslims has been a major problem in the country as President Thein Sein introduces democratic changes after decades of military rule. "State television reported incidents in the three townships in Bago region, all within 150 kilometers (100 miles) of Yangon. The latest attack Monday night was in Gyobingauk, where it said 'troublemakers' damaged a religious building, shops and some houses. "The report said similar attacks on religious buildings, shops and houses occurred in nearby Otepho and Min Hla on Sunday night. Official reports use the term 'religious buildings' in an apparent attempt to dampen passion, though in most cases the targets were reportedly mosques. "The announcement said an emergency law known as Section 144 would be applied in the three townships which will ban public assemblies, marches and speeches, and impose a 6 p.m. to 6 a.m. curfew." The violence began last week following a dispute between a Muslim goldsmith and a Buddhist couple in the central city of Meikhtila. A curfew was imposed in the city to stem the violence that has killed at least 40 people. "The unleashing of ethnic hatred, suppressed during 49 years of military dictatorship that ended in March 2011, is challenging the reformist government of one of Asia's most ethnically diverse countries. That government has released jailed dissidents, held a free by-election and lifted censorship in Myanmar's historic democratic transition. But it has faced mounting criticism over its failure to halt deteriorating relations between Buddhists and Muslims." "Suu Kyi's participation in politics has already done much to legitimize the nominally civilian administration and help lift damaging foreign sanctions against it. "She has also been careful not to threaten the interests of the former military rulers. She has avoided calling for their prosecution, though human rights groups say they are responsible for decades of abuses. In addition, she has ensured the military's biggest revenue source by acquiescing to foreign investment in state-owned energy firms. "And she has declined to speak out on the plight of minorities, including the Muslim Rohingya, many of whom have fled communal violence in the country's west, and Kachin insurgents who have held out against pitched government assaults on their strongholds near the Chinese border."